If you are trying to save space, pick a compact hand truck from Handtrucks2go. These lightweight hand carts are collapsible and are great to to keep in your car as they won't hog up your whole trunk. Perfect as a luggage cart too! Check out our wide selection of different hand trucks! Traveling? Are you looking for a compact, foldable carrier to make your trip easier? Our hand trucks are compact, foldable, strong and flexible. The models for sale here are collapsible and can be kept in the trunk of your car or van for easy access without taking up the entire trunk or hatch. Compact foldable hand trucks take up little space. Handtrucks2go compact hand trucks come in various sizes. Some weigh only three (3) pounds and can be folded to use less space than other conventional luggage and gear carriers. The total pounds that can be stacked on a compact foldable hand truck vary so check the size that fits your needs. Do you have other gear to move along with your luggage? We offer maxi hand trucks to transport duffel bags, electronic equipment, car seats, etc. If you have it, we can help you move it while on the go. Does a student in your life need help transporting their huge stack of books between classes or dorms? A compact, foldable Handtrucks2go is an excellent idea! Checkout the model you are interested in and see additional details that will help you choose the carrier you need. Several are available at discounted prices, along with free shipping. Folding compact hand trucks are great for moving boxes of books, boxes of files, even trash bags for the office or any business! These are excellent choices for the home where small appliances, household goods and other items can be moved from room to room and indoors to outdoors. If it is too heavy to carry, move it with a compact hand truck of your very own. Plus, since there are several foldable models, they are easy to store and fast to access. 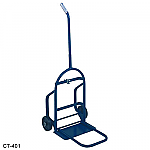 The compact hand truck can be stored in the pantry, garage, closet, or under a bed. As any piece of equipment, there are limitations that should be considered in using a hand truck. Choose the one that will help prevent possible physical injury to someone’s back, neck, arm, etc. but do not overload the hand truck you choose. Correct loads will prevent damage happening to your new compact foldable hand truck. The compact folding hand cart makes a great gift because just about everyone can find a use for these great little movers. Do you have a pet and need to move the crate your furry friend travels in? Checkout the many different sizes of these foldable, compact, hand trucks on this website! When finished moving the crate, fold the hand truck, place it where it can be easily found the next time it is needed and the work is done. Still have questions? Just pick up the phone and give us a call. We can help you find the right one for you! Our associates are knowledgeable and are waiting to help place your order today. We will have it shipped and on the way to you fast with free shipping! 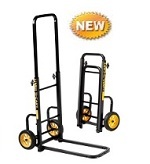 Come get your small compact hand truck now at a great price!